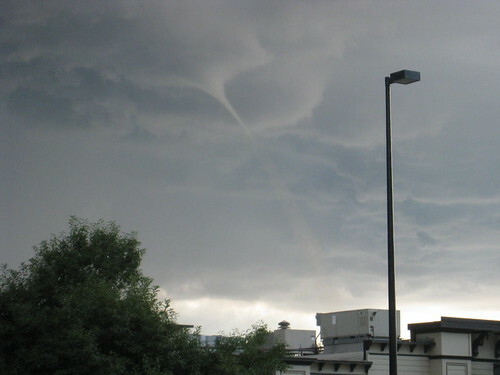 I just happened to be in Parker Colorado (near Denver) yesterday when the Tornadoes touched down. I was headed into a restaurant for dinner when we looked up and saw this. There were no sirens and at first the people around us didn’t notice. I didn’t learn until later that it’s the most dangerous when it’s straight up and down. I head conflicting reports of how close it actually was to where I was at. The odd thing I didn’t notice until it was over was how still it was. No wind. Despite living in both Iowa and Missouri, this is the first time I’ve seen a tornado. 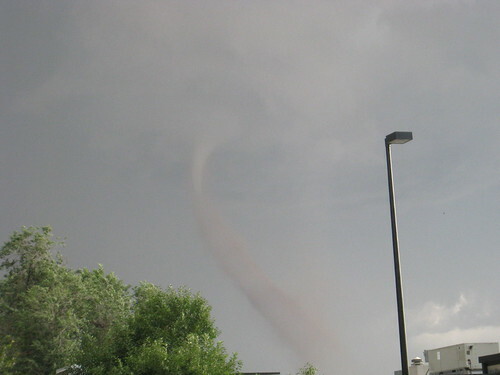 There were two tornados that touched down and luckily no one was hurt. Living in Kansas, these videos hit close to home for me. You mentioned how still it was. I am certainly not a meteorologist, but I can tell you that every single time I’ve been close to a tornado, there is total “stillness”. An erie, freaky type stillness. So, as long as it stormy and still fairly windy outside, I don’t get too worried about tornadoes. It’s when the total stillness comes that I really start to get worried. And then when you hear the dull, low roar, train engine sound, (the unmistakable sound of the tornado), all I can say is you better be already in your shelter at that point! Thanks for sharing the pictures. Amazing pics! 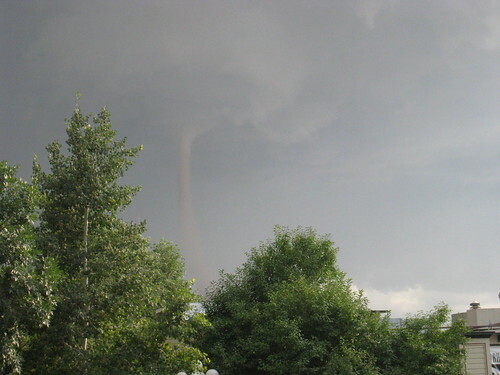 Jaime – Despite growing up in Iowa and living in Missouri now I’ve never seen or even been close to a tornado before. It was truly amazing. I’m very grateful no one was hurt I know they can be devastating. ← Is Library 2.0 and/or Web 2.0 really serving our patrons?